I have promised myself that I will sew as much for my son as I do for my daughter. So far I think I am doing a good job of this, but it is hard, as there are so few patterns for boys. Really, how many shorts patterns do you need? It seems that when it comes to sewing for my son I am limited to shirts, shorts and pants (apart from t-shirts, but my knit phobia keeps me from trying these yet) whereas I have enough patterns to keep my daughter in a new dress every week all Summer long. 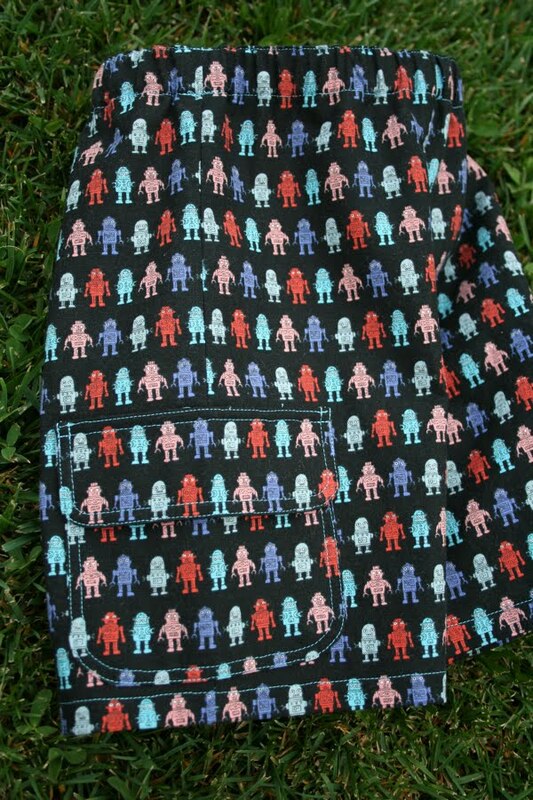 Because there are so few truly different boys' patterns, I am always looking out for cute boyish fabric. Again, the girly fabric market is so much bigger, but there are a few real gems out there for boys. I recently saw some gorgeous robot fabric by Kokka, at Kelani (link to the right) and just had to have it. I knew it would transform my boring shorts pattern into a cute and different little pair of shorts. The pattern I used is Burda 9639, which is a basic, elasticised waist shorts pattern, but with cute patch pockets and flaps on the outside of each leg. It's a simple pattern, although I used some of the Oliver + S construction techniques to make the finished product a bit more professional. 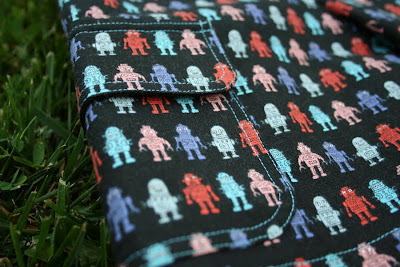 The robot fabric is on a black base-cloth, so i used electric blue thread for my top-stitching to make the pockets stand out a bit, as they're such a cute feature (and I don't own any black thread). I'm really happy with the end result. 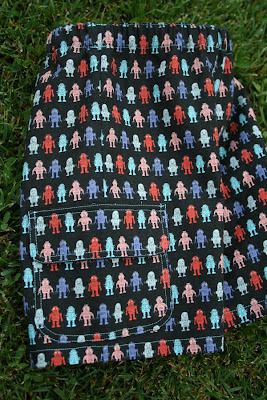 I still have enough fabric left to make my little boy a cute robot hat, or maybe a matching appliqued top. There are patch pockets on each outer leg. 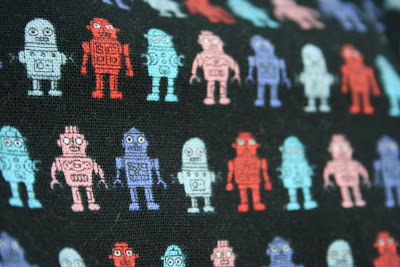 See how the lines of robots match on my side seam? Let's pretend that was intentional and is the same on the other side. Detail of the blue top-stitching. 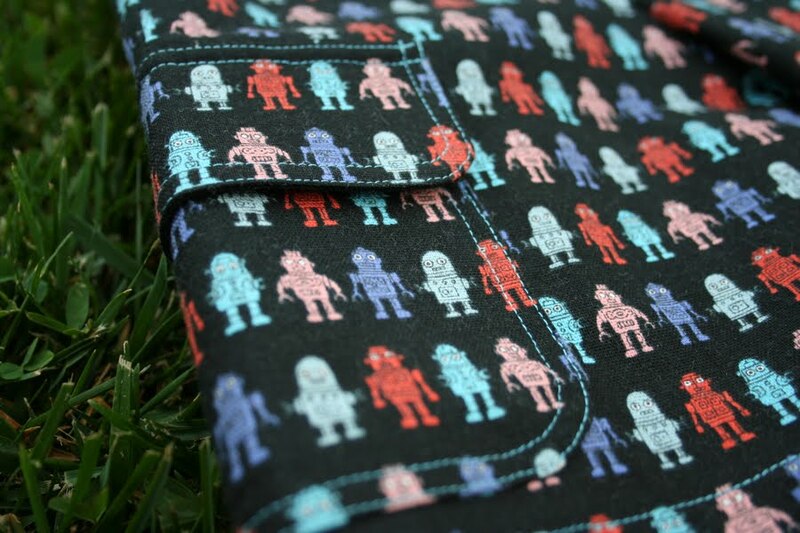 I adore this fabric. These little guys are less than 2cm tall, so the amount of detail they included is amazing. Cute shorts!! I agree good boys fabric is hard to find!